Following another disappointing season with the Toronto Raptors, things have changed for Chris Bosh. After basically wasting seven years as a great player on a horrible team, Bosh went down to South Beach to join Dwyane Wade. Only a day later, LeBron James also joined the Miami Heat. Going from missing the playoffs one year, to possibily winning a championship the next, Chris Bosh is overjoyed. With everything going strong for Bosh, he plans to keep things in his favor. Recently, the NBA star popped the question to his longtime girlfriend. Towards the end of August, Bosh proposed. 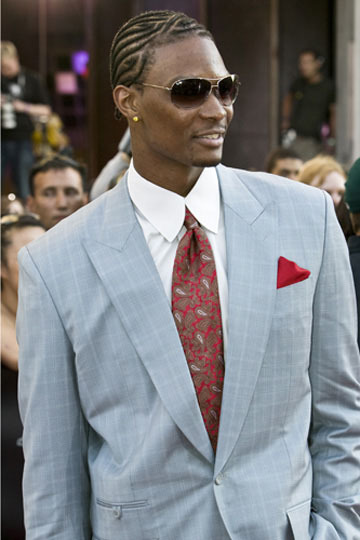 The story has been backed up by Bosh's representative, Tammy Brook. She confimed that Chris Bosh proposed the traditional way, getting down on one knee. Bosh met his girlfriend, Adrienne Williams and they began dating a year ago, during his days in Toronto. This caps off a summer that included an appearance on the HBO series, "Entourage," ringing the New York Stock Exchange bell, and doing the "Got Milk?" commercial.